Hall, Patricia... Passed away peacefully at Warkworth Place Nursing Home on Thursday, April 4th, 2019 at the age of 77. Loving wife of John Hall. Beloved mother of Gregory Scott Hall & his wife Kirsten and proud grandmother of Kimberly who are all residing in Germany. Cherished sister of Karen Miller of Belleville and Sharon Esper of Tillsenburg. 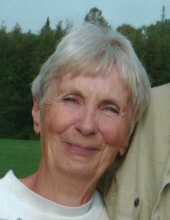 Patricia was heavily involved with The Therapeutic Touch, Cobourg as a passionate teacher and practitioner. Keeping with Patricia's wishes, cremation has taken place. Arrangements are entrusted with WEAVER Life Centre - Campbellford, 77 Second Street. "Email Address" would like to share the life celebration of Patricia Hall. Click on the "link" to go to share a favorite memory or leave a condolence message for the family.